Such was the case for Greenfield’s first-year head football coach and Athletic Director Steve Cole. 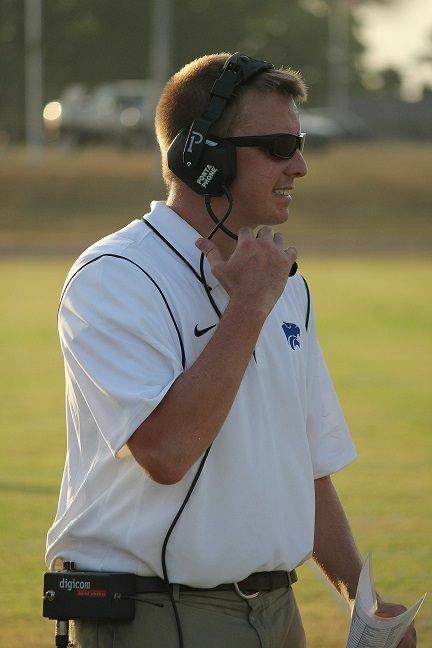 After serving as a student assistant at the University of Arkansas and an assistant coach at Southwest Baptist University in the past five years, Cole coached defensive tackles at Glendale last season. He came to Greenfield this season with a chance to install his own system, instill his own coaching philosophy, and run his own program. Greenfield’s season ended without much fanfare on Oct. 24 with a 68-22 loss to Tarkio in the district opener. The Wildcats posted a 1-8 record this season, but the mere fact that Greenfield had a season says a lot about Cole, his assistant coaches, and the players who snapped a chin strap for the Wildcats this fall. This tale of perseverance and teamwork begins last June. The numbers were low over the summer, but Cole and his assistants assumed that more kids would come out for football as August got closer. That wasn’t the case. By “8-man,” Cole is referring to 8-man football, in which teams play with eight players per side rather than the customary 11 per team. There are some other differences, too, such as the field being 20 yards shorter in 8-man. Yes, it’s football, but schematically and fundamentally, it is an entirely new sport. Greenfield definitely has athletes, some of whom were a part of the Wildcats’ Class 1 state track and field championship last spring. 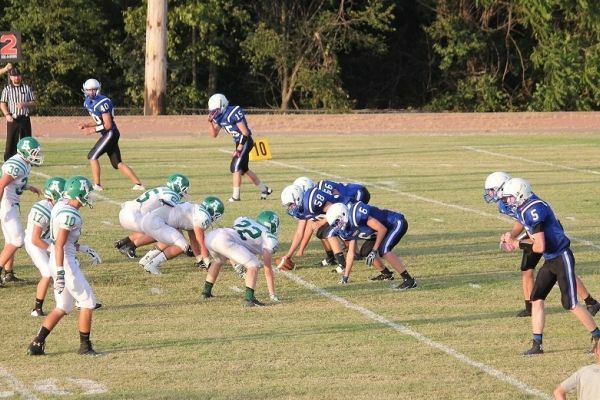 What the Wildcats did not have was experience playing 8-man football. Add to the lack of experience the fact that Greenfield was limited in numbers to begin with, and the Wildcats had to basically learn a new sport on the fly in just a handful of practices. In addition, once the decision was made in early August to play 8-man, Greenfield also did not have a schedule. 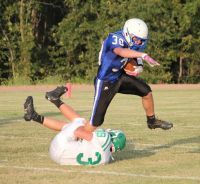 Greenfield’s originally scheduled opponents, including the rest of the Spring River Valley Conference, were given an option: play 8-man against Greenfield or find a different opponent. Cole was left to work the phones trying to put together a schedule for the Wildcats. There are 20 other 8-man football teams in Missouri, but most of them are scattered up north along the Iowa border. Most of them already had their schedules filled, too. The schedule gradually came together, but it was often a week-to-week proposition. “Developing a schedule was difficult,” said Cole, who had to adopt an “anywhere, anytime” mentality, as most teams were not willing to make the trek to Dade County. That resulted in a schedule that included just two home games, plus an unintentional “bye” week on Oct. 10. Greenfield hosted Albany on Aug. 22 in the season opener on a hot, late summer night. There were plenty of fans on hand, most wearing blue, black and white, and many curious as to what they were about to witness. The Wildcats, who lost the game 66-0 to the far more experienced Warriors, received a baptism by fire. One thing that quickly stood out about 8-man football was the scoring…and lots of it. The style of the game is suited to wide open, high scoring games. In fact, Albany would go on to average almost 62 points per game in its nine wins this season, including games of 84 and 88 points. The entire offensive and defensive philosophy is different between 8-man and 11-man football. Cole, who had been waiting for his opportunity to be a head coach, had to scrap his entire playbook and start from scratch. With the situation presented to Cole and the Wildcats, just playing football this fall was an accomplishment. Facing teams that were far more experienced with the 8-man game, or teams with far more players, a win for the Wildcats was out of the question...or was it? On Sept. 12, after three-straight losses by a combined score of 169-28, Greenfield took a nearly four-hour bus ride north of Kansas City to DeKalb. The Tigers have been playing 8-man football since MSHSAA first sanctioned the sport for the 1988 season, and have a couple of state runner-up finishes and the 2002 state championship on their 8-man resume. Greenfield 14 DeKalb 12. Final. Although there were no more wins on the schedule, the Wildcats continued to improve throughout the season. In fact, Greenfield was playing its best football when the season ended. 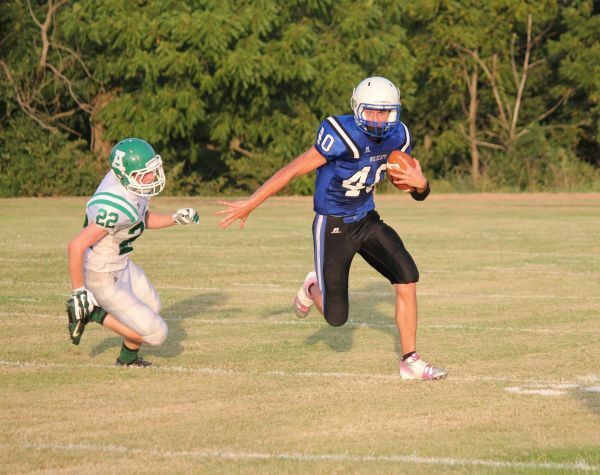 Despite the district-opening loss to Tarkio, the Wildcats rewrote the record book with their explosive, quick-hitting passing game. Quarterback Mason Jones, who started the year at wide receiver, threw for 329 yards and three touchdowns on 21-of-34 accuracy in the loss to Tarkio, all of which were school records. Tight end Carl Mason caught 15 of those passes for 221 yards and a touchdown. Jones is a shining example of Cole’s motto for the team: “Adapt and Adjust.” Jones lined up at receiver in the season opener, but injuries forced him to change positions…and forced him to learn an entirely new position in a week. The Wildcats were forced to play “iron-man” football, with everybody contributing on both sides of the ball, and on special teams. Mason, the team’s standout tight end, also handled the punting duties for Greenfield. Sophomore Jerrett Esposito was a ball hawk on defense, and led the team in tackles while forcing 12 fumbles and recovering two. Freshman Charles Servoss rushed for over 700 yards in eight games and averaged over 10 yards per carry, while Roy Beeson was the Wildcats’ most improved offensive and defensive lineman. Cole was not alone in having to adapt as a coach. The Wildcats’ three assistant coaches (Lee Coleman, Brandon Thompson, and Josh Dobson) also had to take on new roles and learn the 8-man game from scratch. “Lee Coleman is a true players coach,” said Cole. “All the players love him, and he has a very high football IQ. He helped in so many ways. I never had to ask him to stay late and do something. He just gets the job done. The Greenfield administration was also supportive, providing whatever support was needed. Speaking of support, the town of Greenfield was unwavering in its loyalty. With a schedule that included just two home games, the Wildcat faithful made weekly road trips to whatever faraway destination was playing host to their boys in blue. All of the Wildcat players are appreciative of Cole, too, and how that he turned what could have been a disaster into a memorable season. One common lesson learned from Cole was to never give up, regardless of the task or odds. Things did not go as planned this season for Greenfield, the 1977 Class 1A state champion that has a proud tradition and football history. The Wildcats could have skipped this season altogether, but it’s a whole lot easier to not start the program back up than it is to persevere and go with Plan B. “I want to say thank you to all the players, coaches and fans at Greenfield High School,” said Cole. “The season did not go the way we wanted or even anticipated. It will be a process to build this program into one that this community deserves, but that is what we are working toward every day of the year. Better days are ahead. The future is bright. This team did not let football die in Greenfield, and that speaks volumes for the kind of community that Greenfield is. They have raised quality young men.